If you are looking for a heavy duty punching machine capable of handling large sized jobs in a high production facility, then the Rhin-O-Tuff HD7700 Heavy Duty Electric Punch may be the right machine for you. In this in-depth review we will examine the HD7700 Punching Machine, explaining what makes it great, as well as it’s limitations. With this knowledge, you can be sure to find the perfect heavy duty punching machine for your specific needs, without the hassle of comparing machines on your own time. The Rhin-O-Tuff HD7700 14" Electric Punch is known as the ultimate in desktop punches. As one of the largest and most durable binding punches available, it is specifically designed for high volume users such as binderies, printers, copy shops, in-plant print shops and large organizations. The HD7700 Punch offers the ability to quickly change punching patterns simply by sliding out one die and sliding in a new one. This machine is known for its rugged industrial construction and is designed for high volume production environments where productivity is essential. In fact, it offers the largest punching capacity of any modular binding punch on the market today. The Rhin-O-Tuff HD7700 gives you the opportunity to punch with a variety of different binding methods, including Wire-O Double Loop Binding, Spiral binding Plastic Coil Binding, Plastic Comb Binding, 3-Hole Punching for binders, and 11 Hole Hot-Knife VeloBind Strip Binding. You can expand your business by simply purchasing these HD7700 punching dies. 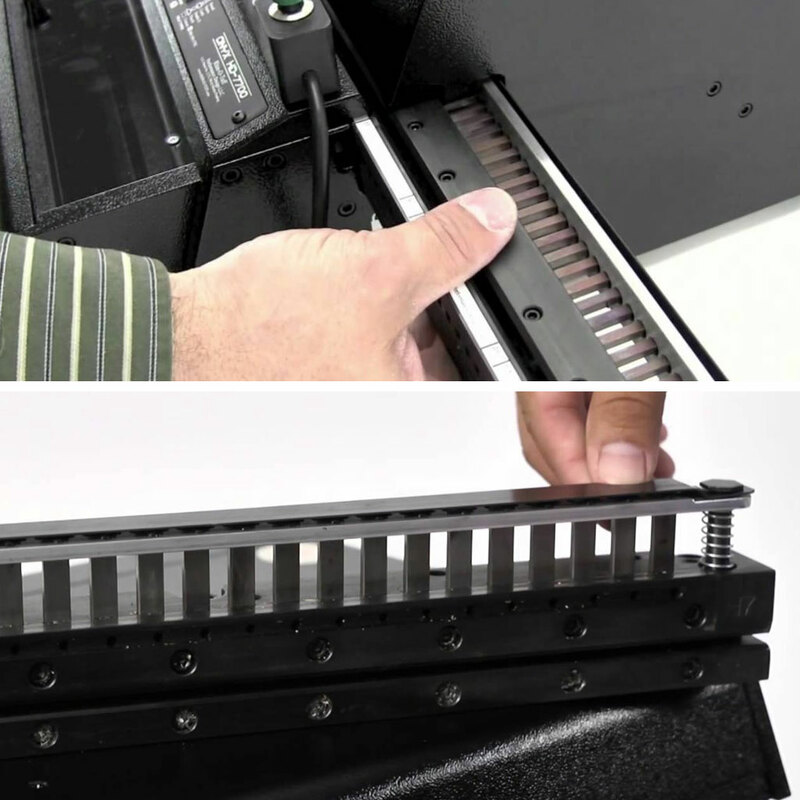 The die changing mechanism is simple, and can be done in just seconds with the patented quick change die system. There are no tools required for the change, eliminating the possibility of misplacement and the stress and time consumption of screwing and unscrewing a part. • Durability: The HD7700, like all Rhin-O-Tuff punching equipment, is made of only heavy duty parts that are built to last, even under the extreme stress that goes along with a high production environment. 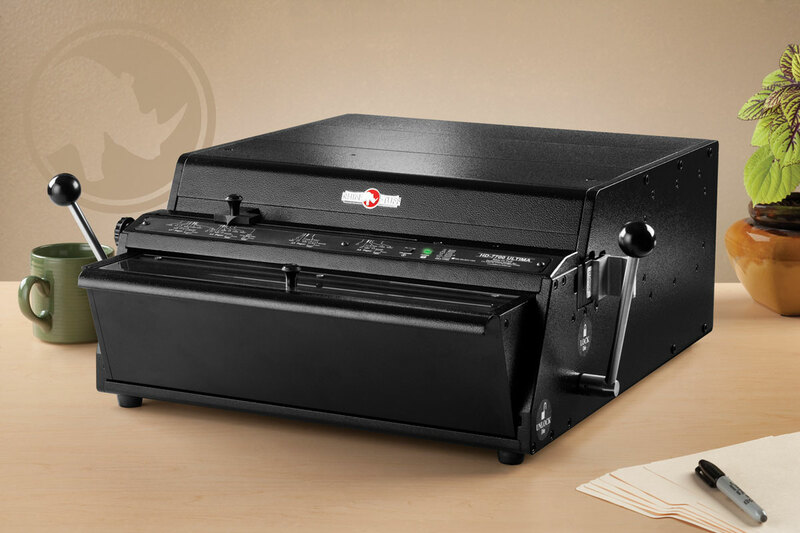 • Versatility: The HD7700 has the capability to bind in 12 standard punching patters, or up to 20 non-standard punching patters, with just a simple switch of the die. • Speed & Efficiency: The HD7700 has one of the highest sheet punching capacities on the market, powering through a stack of paper consisting of as many as 55 sheets of 20lb paper. This eliminates the number of punches needed to complete one book, dramatically increasing the speed and efficiency. • Disengageable Pins & Open Throat: The HD7700 features fully disengageable pins so that you do not end up with half of a hole when doing sheet sizes other than the standard 8.5” x 11” letter size documents. The open throat allows for punching of documents larger than the 14” wide. • Hands Free Operation: The HD7700 is operated using a foot pedal, allowing the operator use of both of their hands during the entire punching process. • Quiet: New, Onyx quietized dies are much quieter than the original HD7700 machine (watch the video below with the sound on to compare). • Size & weight: The HD7700 is made of high-quality and durable parts, making it heavier than many punching machines, and more difficult to transport around. It weighs approximately 95 lbs unpacked with a die. • Margin Depth Control: The HD7700 has a set margin depth that cannot be adjusted, except with the plastic comb die, which features a unique margin depth control. • Diameter Guide: The HD7700 does not feature a diameter guide, which is a little tool that helps you determine what size binding supplies you will need based on the thickness of your book. • Shipping Weight: 103 lbs.